DAX index has shown a good jump from the yesterday low of 12178 and closed slightly higher at 12341 0.77% higher. US futures has shown a good jump as Donald Trump agreed to meet North Korea Kim Jong Un . S&P500 futures is trading slightly on the higher side at 2739 0.65% higher. Asian stock indices are trading lower on the footsteps of US markets. DAX index has formed a minor top around 12605 and started to decline from that level. The index should close above 200- day MA at 12740 for further bullishness. The minor bullishness can be seen only if it closes above 12320 (10- day MA) and any close above will take the index to next level till 12500/12605. It should break above 12740 for further bullishness. 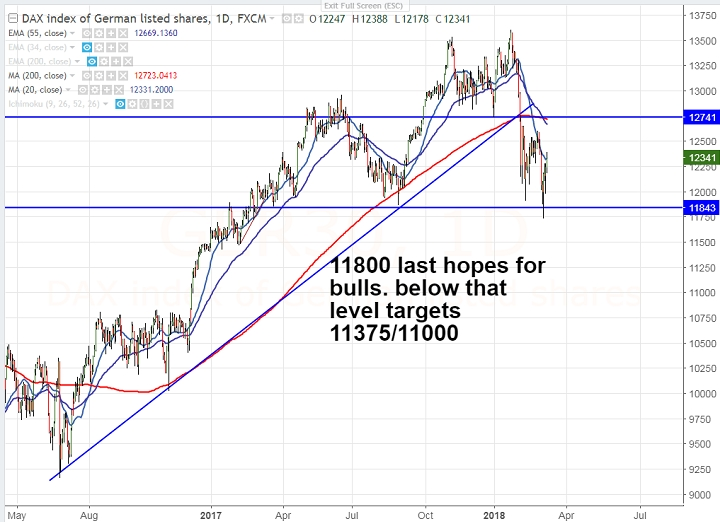 On the lower side, near term major support is around 11800 and any close below will drag the index till 11400/11000.The minor support is around 12000. It is good to buy on dips around 12150-200 with SL around 11975 for the TP of 12660/12740.